This page can only be for ancestors of Joseph Angelo Quilietti. It was Joe who married Jeannie Boyle and through this line we are connected with the very Irish Boyle surname and the Pinkerton Walker lines beyond that. Jeannie Boyle’s dad was born on May 3rd 1857 in the mining village of Garsherrie in Lanarkshire. James’s father was also James Boyle and his occupation was a furnace keeper in the coalmines. His mother was Jean Walker. This occupation was also to become James’ when he was probably a small boy. James went on to marry Roseanne Smith Kay who was a widow. Roseanne was born in London. Roseanne already had two children when they married in 1900. Her eldest daughter was Ellen Smith who was born in 1891 and Rose Anne Smith who was born in 1897. Then along came our Granny, Jane Boyle born in 1901 and Jemima who was born in 1904. James Boyle, our great grandfather worked in the mines of Lanark until he died very suddenly on an outing to Glasgow on 19th September 1917. His nephew James Muir was with him at the time . This document also gives us his address at the time of his death as Railway Terrace in Coalburn. Going back now to James Boyle’s parents. They were James Boyle and Jane Walker . 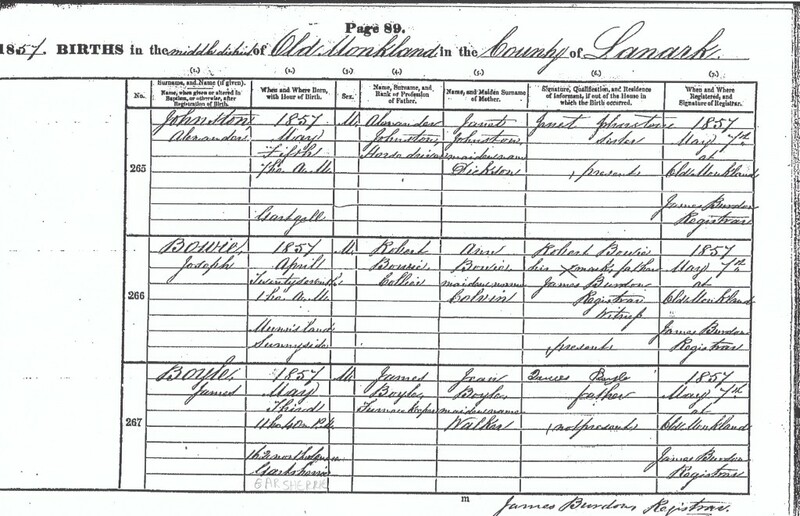 Jane was born in Swine in Ayrshire circa 1824 and James in Lanarkshire 1821. Luke and Betsy were married in Old Monklands in Lanark in the year 1821. Luke’s father was also called James Boyle and he was born in Ireland. Going back to our great great grandfather James who married Jean or Jane Walker. Their marriage was fruitful and they had at least 12 children Some of these offspring had the same names as their siblings, indicating that there was a couple of their children who had died young. So there was Jane, Anne, Luke then another Anne. Then came another Luke, Elizabeth, Henry, James, Mary and Margaret. Jane Boyle was the sister who married into the Muir family and whose son was with our James when he died in 1917. Luke Boyle married Agnes Smith and they settled in Shotts where he died in 1891. Elizabeth Boyle, or Betsey as she was known married into the Brown family and they emigrated to New South Wales. Their family are still there today. Helen [author] has met up with a descendant of this line in Edinburgh in 2011. The 1851 Scottish census shows James and Jane living in Bo’ness West Lothian and working in the Iron Works there. By 1961 with the arrival of more children they resided at 3 Flat Row in Shotts and still working in the Iron works. The 1871 Scottish census shows the family living at 42 Muirhead Road in Shotts, Lanarkshire. They had moved from Bo’ness in West Lothian to Dalry in Ayrshire and Shotts and Gartersherrie in Lanarkshire following work and settling in the villages of Ayrshire and Lanarkshire, James worked in both the Iron Works and the Mines, just wherever he could find work really. In the year 1874 Jane was killed in Storringshaw Pit in Lanarkshire. We know it was some kind of accident but there was no cause of death on the official document. 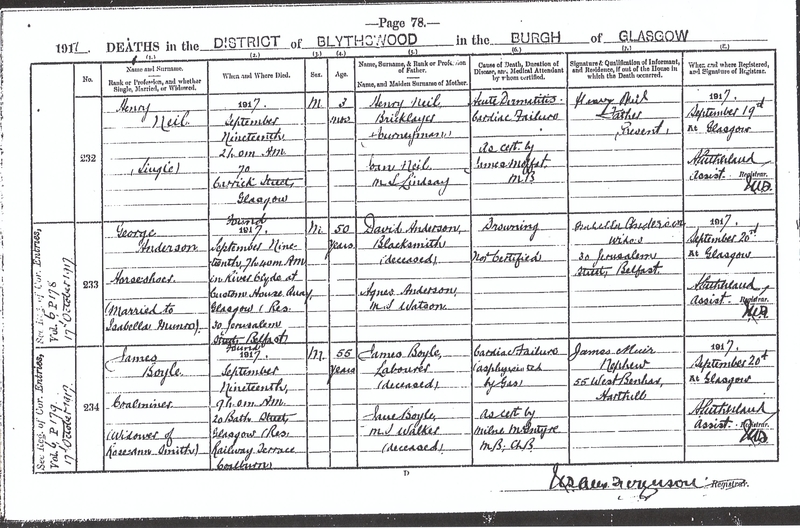 The 1891 census tells another story, Jane was now deceased and James was living with his daughter Jane and her husband James Muir and their family. He was now 70 and still working as a miner. The address was 56 Coal Row in Shotts in Lanarkshire. 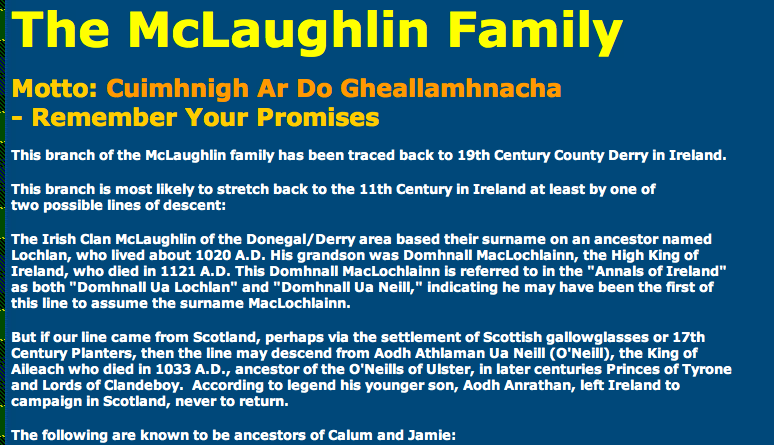 This is a world famous Scottish, and sometimes Irish, locational surname. It originates from the barony of Pinkerton near the town of Dunbar, in East Lothian, Scotland. It is first recorded in the year 1296 when the landowning nobility of Scotland were required to sign allegance to the short lived republican government of John Balliol overthrown by the famous Robert, the Bruce, in 1306. One of the signatories was Nicol de Pynkertune, and it is said that a surviving example of his seal, although not his coat of arms as this is not known, is inscribed with a mastiff dog and the name Sir Nicolai de Pinkerton. A knighthood in those far off days was less formal than today. It may have implied that he was a trained horsemen with his own armour, and available for service to who ever paid best. The name “moved” to England in the late 14th century when Patrick de Penkerton, so much for spelling, was living under protection in England. Whether this was temporary or permanent is not known. It seems that in the 15th century the barony became part of the estates of the earl of Argyll, and that Pinkertons settled in Ireland from about 1641. The surname Pinkie is also associated with the name, but this is not correct, the Pinkie’s being from the lands of Pinkie in Midlothian. The original spelling was Pontekyn, becoming Pinkie in the 16th century. Pinkerton is Scottish and is a recognized sept of Clan Campbell. “A History of Clan Campbell, Volume I” notes The surname of Pinkerton comes from the place of the same name near Dunbar, in East Lothian. In 1483, Colin, 1st Earl of Argyll, “for his faithful and gratuitous service” received a Royal Grant of the lands of Meikle and Little Pinkerton, forfeited by the Duke of Albany. The lands were by the same charter incorporated into the Barony of Pinkerton. And further states, On the tenuous basis of the above, the name Pinkerton has been listed as a Campbell sept. The most famous holder of the name is the well-known American detective, Allan Pinkerton. Our 3rd great Granny Mary Pinkerton was born in Irvine in Ayrshire in 1870. Her father was James and her mother Agnes Thomson. They married on 3rd April 1777 in Irvine in Ayrshire. This line of the Walker Family were also from the Lanarkshire region of Scotland. We also have Walker’s related through Margaret Walker Morrison’s line [my mum]. 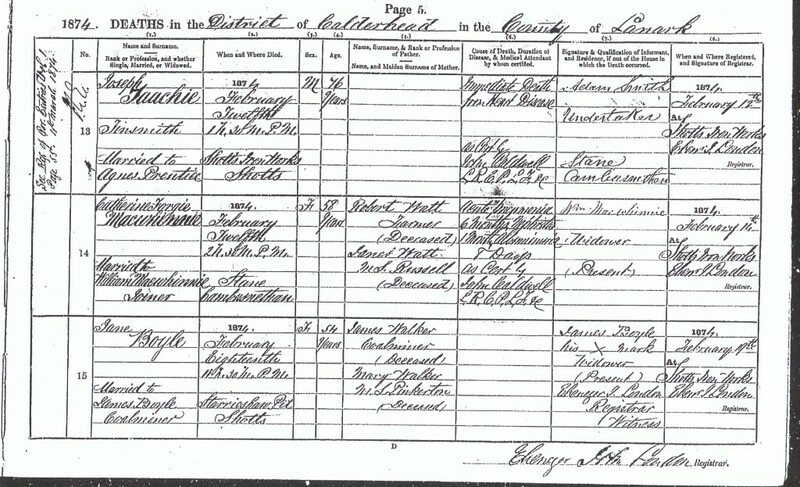 James Walker, my 3rd great grandfather was born in Abbey, Paisley in Renfrew on 18th October 1779. He married Mary Pinkerton circa 1800 and their children came along like stepping stones. James Walker’s father was William Walker, and his mother Margaret Jameison. Margaret Jamieson was born in 1750 in Paisley, one of nine children. Her father was John Jamieson and her mother Margaret Gibbs.